Parents/guardians can submit and verify their student’s demographic information, including health information and emergency contacts through Family Access, which can be reached via the Parent Access site. Family Access also allows change request of their student’s information. Families who do not go online to verify the information will receive a paper form to complete the process. In some instances, the requested information updates will require a staff member to "Approve" the change. An example is a change of address requires proof of residency. 1. How do I access the Online Student Information Verification page? 2. How do I complete the verification process? 3. I received a message that says I'm not in the primary family. What does this mean? 4. I completed the verification process, but the address change I requested is pending approval. What does that mean? 5. I received a reminder saying that I have not verified my student’s information, even though I made changes online. What should I do? 6. I am trying to change the information on my existing Emergency Contact, but I cannot edit the contact information. What should I do? 7. I am a parent who is also an employee (or a former employee) of the district and I am not able to change my contact information online because a message in red says that I have to contact Human Resources in order to make a change. What should I do? 8. I have an Emergency Contact who is also a guardian of another student (or former student) in the district. A message tells me that they have to change their own information. 9. I have some information that is pending approval from the district. Should I wait for the approval before completing the online verification process? 10. Does the system keep a history of all the changes I made? 11. I have other questions regarding my student's information that is not addressed in the verification process. What should I do? 12. How does completing the Skylert process ensure that I can be reached in an emergency? Login to Skyward Family Access by clicking here. If you are a first time user or have forgotten your password, click on “Forgot your Login/Password?” to receive your username and password reset link. Tip: When prompted, enter the parent’s email address provided on the student’s registration form. Click on “Go to Online Student Information Verification for (Student Name)”. 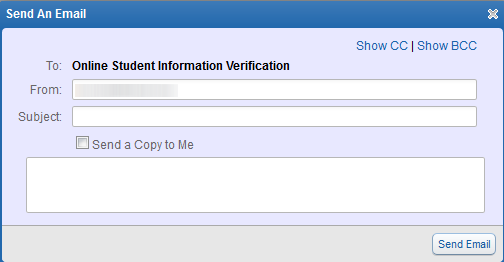 Alternatively, click on the “Online Student Information Verification” button then click on your student’s name. There are several ways to request a change to your student’s information: type over the information, select from a drop down list or click on the “change (item)” link". If the field is grayed out, the field is viewable only and changes are not allowed. Click on “Next Step” on the right hand panel of your screen to go through the different items to verify or click on the actual line item. For each step, click "Complete Step 1a Only" or "Complete Step 1a and move to Step 1b" at the bottom of the screen when done. A check mark will appear next to the item. Clicking on the box completing the step prevents you from making further changes to information on the page. At any time, you may click on the "Edit Step..." button again when done. Please note: The online system asks for your home phone number. This should be your primary contact number. It does not need to be a landline phone. Repeat Step 1 and go through the verification process again for each of your students. A student may have more than one family listed in our database. Our software designates the first family listed in the student’s record as the “primary family” for that student. This family’s address is typically used to determine the neighborhood school the student attends as defined by the district’s school boundaries. It also is the address used by the district’s Transportation Department for busing purposes. If your family is not listed first, then your family will be designated as the “non-primary Family”. It is the responsibility of the “primary family” to verify the student’s information. The “primary family” designation includes both adults if more than one is listed. As a “non-primary Family”, you are still able to make changes to your own family’s information or add emergency contacts using the Online Student Information Verification process. If the record has already been verified by a member of the primary family, you will not be able to make changes. In this case, you may contact either the primary family or the school office to request that the record be temporarily unverified so that you can make changes to your information. Most change requests made through the online verification process is reflected immediately on your student’s information. Because of rules around school boundaries, however, an address change requires approval from the office staff. If your address has changed, please go to the school office and present proof of residency. Is there a check mark by each of the steps? If not, click on the step without a check mark and click the box “Complete step..." button at the bottom of the screen. Click on “Complete Online Student Information Verification”, then click on the “Submit Online Student Information Verification” button. At this time, you cannot edit an existing contact. As a workaround, please delete the contact with the incorrect information and add a new contact with the correct information. Current active employees need to contact Human Resources to update your employee information. Former employees who are also parents should be able to change their personal information without contacting HR. You may delete the contact and add another one with the correct contact information. No. It is not necessary to wait for approval. Once you have made all the changes, you should click on the “Submit Online Student Information Verification” button. We now have a record of the changes you requested and the office staff will follow up with you should they have any questions. Remember, if you do not click on the submit button by the end of the verification period, you may be asked to fill out a paper form just like the old way to complete the verification process. Send an email to your student’s school by clicking on the Online Student Information Verification link under “Contact Us” on the upper right hand corner of your screen. Enter your question in the box and click the Send Email button. Skylert works with our emergency notification system, SchoolMessenger. Through Skylert, you control how we contact you for emergencies, attendance calls, food service balance notifications, and other communications. After logging into Parent Access, click on Skyward Family Access under “For All Parents” on the right. Then click on the Skylert button to see the phone numbers, email addresses, and text message numbers on file for your family. Select the different check boxes to indicate how you want to be contacted for each message type. The Skylert tool then populates the same information into SchoolMessenger to ensure we are calling the correct numbers for emergencies. It does not change your information in the Skyward student information system: if you have a change of phone number, address or email address on file, you must also report that information to the school office. See the Skylert Parent Handout for more information.